Stress echocardiography is a test that uses ultrasound imaging to show how well your heart muscle is working to pump blood to your body. It is most often used to detect a decrease in blood flow to the heart from narrowing in the coronary arteries. This test is done at a medical center or health care provider's office. A resting echocardiogram will be done first. While you lie on your left side with your left arm out, a small device called a transducer is held against your chest. A special gel is used to help the ultrasound waves get to your heart. Most people will walk on a treadmill (or pedal on an exercise bicycle). Slowly (about every 3 minutes), you will be asked to walk (or pedal) faster and on an incline. It is like being asked to walk fast or jog up a hill. If you are not able to exercise, you will get a drug such as dobutamine through a vein (intravenous line). This medicine will make your heart beat faster and harder, similar to when you exercise. Your blood pressure and heart rhythm (ECG) will be monitored throughout the procedure. More echocardiogram images will be taken while your heart rate is increasing, or when it reaches its peak. The images will show whether any parts of the heart muscle do not work as well when your heart rate increases. This is a sign that part of the heart may not be getting enough blood or oxygen because of narrowed or blocked arteries. Ask your provider if you should take any of your routine medicines on the day of the test. Some medicines may interfere with test results. Never stop taking any medicine without first talking to your doctor. DO NOT eat or drink for at least 3 hours before the test. Wear loose, comfortable clothing. You will be asked to sign a consent form before the test. Electrodes (conductive patches) will be placed on your chest, arms, and legs to record the heart's activity. The blood pressure cuff on your arm will be inflated every few minutes, producing a squeezing sensation that may feel tight. Rarely, people feel chest discomfort, extra or skipped heartbeats, dizziness, headache, nausea or shortness of breath during the test. The test is performed to see whether your heart muscle is getting enough blood flow and oxygen when it is working hard (under stress). A normal test will most often mean that you were able to exercise as long as or longer than most people of your age and gender. You also did not have symptoms or concerning changes in blood pressure and your ECG. Your heart pictures show that all parts of your heart respond to increased stress by pumping harder. 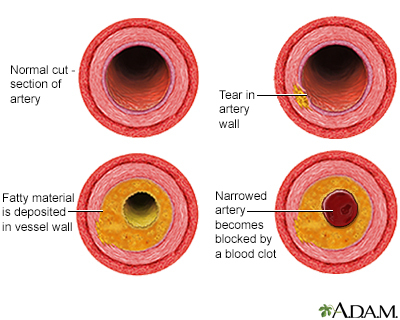 A normal result means that blood flow through the coronary arteries is probably normal. 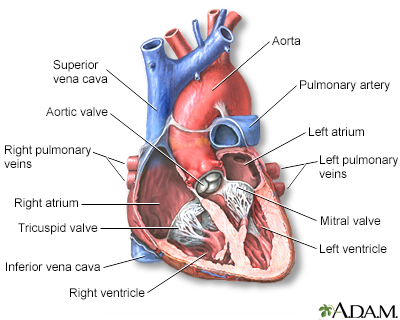 Reduced blood flow to a part of the heart. 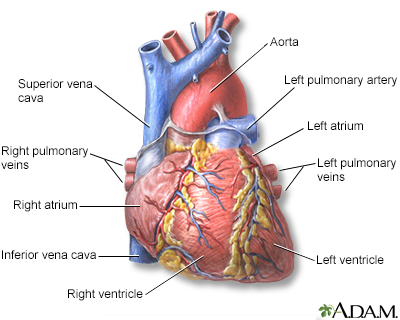 The most likely cause is a narrowing or blockage of the arteries that supply your heart muscle. Scarring of the heart muscle due to a past heart attack. Solomon SD, Wu JC, Gillam L, Bulwer B. Echocardiography. In: Zipes DP, Libby P, Bonow RO, Mann DL, Tomaselli GF, Braunwald E, eds. Braunwald's Heart Disease: A Textbook of Cardiovascular Medicine. 11th ed. Philadelphia, PA: Elsevier; 2019:chap 14.